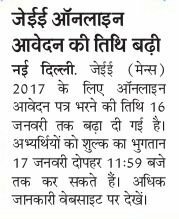 JEE Main Exam 2018 (आईआईटी संयुक्त प्रवेश परीक्षा): Joint Entrance Exam Main is conducted by the IIT’s, this year the JEE Main Examination 2018 will be conducted by IIT Madras. This entrance examination is conducted in both online and pen & paper mode, that is used to be conducted at various examination centers all across the country, every year. 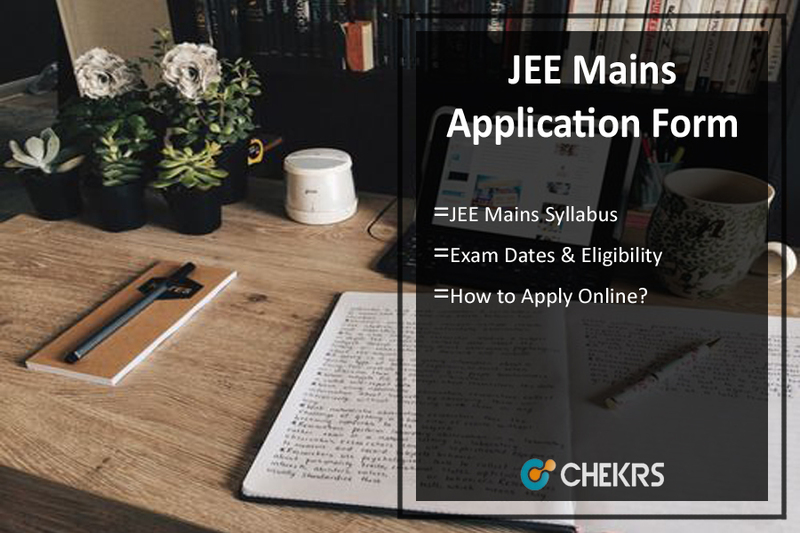 The deadline for the JEE Mains Application form submission is January 2018, after that the online application link will be disabled from the official website The last year approx 12 lakh appeared for the Joint Entrance Exam Main 2018. This examination is on the National level and for the undergraduate applicant who has applied for this entrance examination for B.Tech programmers courses. Applicant has to fill the JEE Main Registration before the last date of the filing the application form. The online application form filling mode is online. The Joint Entrance Exam Main 2018 will be conducted in April 2018 and then after that, the JEE Mains Result 2017 will be released in April 2018. The candidate whose name come in the top 2 lakh candidates of JEE Main Exam, then they were eligible for JEE Advanced. This is the second examination stage entrance test to get admission to IITs and ISM. Following are the process to fill the online application form which is as follow. Firstly eligible applicant has to register on the official website. That applicant will get the username and password after that login. Fill the online application form carefully without any mistake. Pay the application form fee through Net Banking or E-Challan. Upload your recent photo, Signature and left thumb impression in JPEG formats. After that click on the submission button and submit the application form. Take print out of the application form for other uses. All the applicant have to meet their eligibility criteria if they are interested in applying for the JEE Main examination. So here is the JEE Main 2018 Eligibility Criteria for the entrance examination. The candidate who wants to apply for the Joint Entrance Exam Main they should have to complete their 10+2 education qualification from the recognized education board. 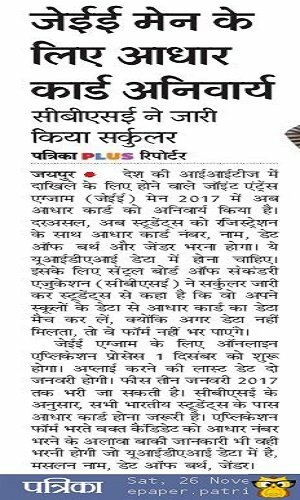 Interested applicant should have taken least five subject their class 12th they will be eligible for the JEE main 2017. The syllabus of joint entrance exam includes all the topics that are there in the class 11th and 12th syllabus of CBSE/ State board exam. The questions will be asked from Physics, Chemistry, and Mathematics. Candidates are advised to follow the links given below to access the PDF’s of the subject wise syllabus for Joint Entrance Exam 2018. It will help the applicant to know the weight of the questions that are asked from various subjects. JEE Mains will be conducted into 02 parts (Paper-I and Paper-II). Paper-I includes the subjects PCM (Physics, Chemistry, Maths) & Paper-II includes the subjects Maths, Aptitude, Drawing. Sample paper will help the applicant to score good marks in their examination. By the help of these sample papers, the applicant will know that in with subject they are comfortable and can be able to provide more time to that subject accordingly. The Applicants will get sample paper that they get to know the format of the Exam which will help to the applicant. The JEE Main 2018 entrance examination form filled by an eligible applicant. They will get the JEE Main 2018 Admit Card. Applicant has to carry their admit card in the examination center. Without the hall, ticket applicant will not allow in the exam center. On the admit card the details of the center are given like name of the center and full address of the examination center. The applicant will able to get their Hall Ticket on the official website.Along with the admit card, the applicant has to carry the photo I’d in the examination center. Before going for the examination applicant must see given instruction and also follow the instruction while examination. The JEE Main Result 2018 will be announced on the official site after the exam. Students need to download result by entering the roll number and FOB of the applicant. The Result will be provided with the score card and AIR Rank. Only the selected, candidates need to fill the counseling form of JEE Admission they pass the exam. The counseling will be held for providing the seats to the aspirants according to the rank list. By the JEE Main Counselling Process, the students will take the admission in the B.Tech courses in the various institutes. The counseling process will be regulated by the JOSSA. The Joint Entrance Exam Main is conducted every year by the IIT’s, this year IIT Madras has taken the responsibility to conduct the JEE Mains 2018. This examination is held every year and to get admission in the Indian Institute of Technology (IIT) and the second one is Indian School of Mines (ISM) Dhanbad. The Joint Entrance Exam is on the national level examination for undergraduate candidates. This examination is used to be conducted in both the modes, online as well as offline also. In this article, the student will know about the JEE Main examination process like eligibility criteria, Application form process, Important dates etc. For any other issues concerning the JEE Main Exam 2018, you are advised to ask us your queries by commenting at the end of the post.